A policeman has admitted downloading child abuse images and having illegal ammunition at his home. 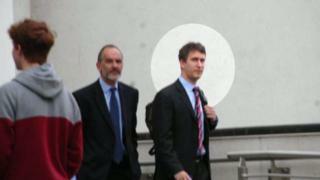 PC Jonathan Fulcher, who is currently suspended, admitted five offences when he appeared at Exeter Crown Court. Fulcher, 34, of High Road, Crediton, admitted three counts of making indecent images of children. Police found almost 300 pictures in total. He also admitted possessing ammunition without a certificate and possessing PAVA incapacitating spray. The court heard that four of the images found on Fulcher's computer were classed as category A - the most serious type of abuse image. He also had nine in the second-highest category, and 277 category C images. Janice Eagles, prosecuting, said some of the lowest category images were produced during online chats with girls "who may have posed erotically during the conversations". Fulcher denied attempting to cause a child to watch him perform a sexual act but the Crown Prosecution Service asked for 14 days to consider whether to continue with the charge. Judge Geoffrey Mercer granted him bail but told him: "That is no indication whatsoever of sentence." Fulcher now faces being dismissed.